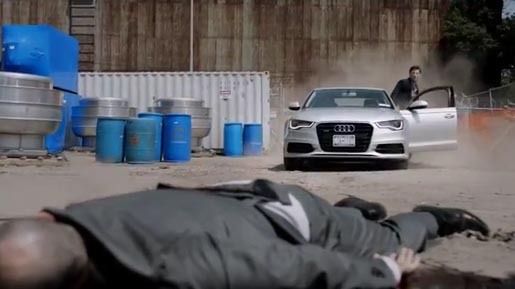 Audi, in association with FX Networks, is running “Untitled Jersey City Project,” a jointly developed 16-minute short-form original drama featuring the 2012 Audi A6. The series premiered on Sunday, September 25, and will roll out over four consecutive weeks as eight, two-minute episodes airing during FX’s Sunday primetime movies. Each of the eight instalments appear as fragments of a television series or film, supplying a piece of a puzzle involving men working for an architectural firm who are hiding a dark secret. The “Untitled Jersey City Project” television experience is extended online at untitledjerseycityproject.com, where visitors will have the opportunity to explore the interactive world of Jersey City and find clues to piece together the mysteries from the entertainment concept. Visitors will also be introduced to new storylines and characters, have the opportunity to read work-in-progress screenplays, and engage with the “Untitled Jersey City Project” by offering suggestions for titles of the series. Videos are available on the UJCP Youtube channel. Filming was shot by director Daniel Minahan via Audi’s Studio Progress Films. Post Production was done at Cutting Room, New York, by editors Chuck Willis and Mike Douglas. Visual effects were produced at Light of Day, New York.